There’s a reason people love horror movies and thrillers. It’s that feeling you get when your heart races, your eyes get wide, and you start thinking “Oh s**t, oh s**t! RUN!” The first time I ever felt that feeling was when I first saw 1993’s Jurassic Park. I loved the movie so much, that I actually wanted to be a paleontologist when I was 5 years old. Two sequels followed, and while they were entertaining, they couldn’t quite capture the sense of wonder that encompassed the original. With Jurassic World, Director Colin Trevorrow and company hope they can recapture that magic that seems to have gotten lost over time. Failing to include the theme park element in the plot was one of the biggest draw backs to The Lost World, and Jurassic Park 3. But this time, the park is now open. Set roughly 20 years after the catastrophe that saw dinosaurs run amuck following employee sabotage, the kinks of founder John Hammond’s groundbreaking theme park have been essentially worked out. Jurassic World, as it is now called, is fully functional with genetically recreated creatures ranging from giant sea monsters, flying pterodactyls and of course, the T-Rex. But apparently, living dinosaurs aren’t enough. Tourists and investors want bigger and scarier and something fresh (there’s a metaphor for summer films in there somewhere). This leads to the park scientists, lead by Dr. Henry Wu (B.D. Wong reprising his role from Jurassic Park), bio-engineering the first hybrid super dinosaur named Indominus Rex. You can guess what happens from there. Many of the decisions made by characters in this film are incredibly dumb. I’m talking ‘exploring an abandoned cemetery’ or ‘hearing a scary noise and going to see what it is’ type of dumb. But it shouldn’t bother you, because we all want things to go south. We want park operations manager Claire Dearing (Bryce Dallas Howard) to ignore common sense and refuse to evacuate the island at the first sign of trouble. We want park C.E.O. Simon Masrani (Irrfan Khan) to try and capture the Indominus Rex alive to save his investment instead of trying to kill it. We want teenage brothers to foolishly wander off on their own in a theme park filled with deadly dinosaurs. 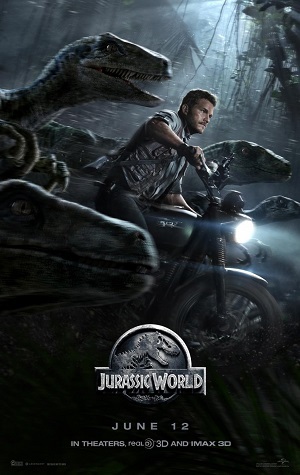 We want raptor tamer Owen Grady (Chris Pratt) to be a badass who no one listens to despite the fact that he seems to be the only one who knows how to deal with the creatures. Why? Because those are the things that make horror films, disaster movies, and thrillers the most fun. And Jurassic World is off the charts on the fun scale. Even before the inevitable disaster that sends everyone screaming in terror, the film captures the sense of wonder that a child would get at his first trip to the zoo. From the moment we hear John Williams’ iconic theme, we feel like we’re back in Jurassic Park, and that’s something none of the previous sequels manage to recapture. Once the chaos ensues, it is as heart pounding as ever even if it feels cheesy. The final sequence seems ripped right out of a Godzilla movie, and I enjoyed every second of it. Jurassic World isn’t a cinematic classic with a ton of memorable characters. The one exception is Chris Pratt’s Owen Grady who is witty and cool from start to finish. And several subplots, particularly one about a government official (Vincent D’Onofrio) trying to weaponize raptors for the military, could have been left on the cutting room floor. But the movie is absolute gold as summer entertainment. More importantly, to fans who grew up re-watching the original over and over again, it is beautifully nostalgic. This Post was posted in 2015 Reviews, Best Movies 2015, Film Reviews, Movie Reviews and tagged Bryce Dallas Howard, Chris Pratt, FIlm Critic, Irrfan Khan, Jurassic Park, Jurassic World, Movie Reviews, Summer Movies, Vincent D'Onofrio. Bookmark the permalink.